There are currently 10 or fewer games left in the NHL before the playoffs start. 10 or fewer! With crunch time upon us, who is doing well and who needs a kick to keep going? Read ahead to find out. Ottawa Senators – The Senators have a little bit of The Little Engine That Could in them, this season. With no real star power on their team, they have plowed through some of the best teams in the NHL. They recently beat both Montreal and Boston and on March 16th they came ever to close to taking out the powerhouse Blackhawks. They currently sit 3 points behind the Canadiens for first in the Atlantic Division, and have a game at hand. 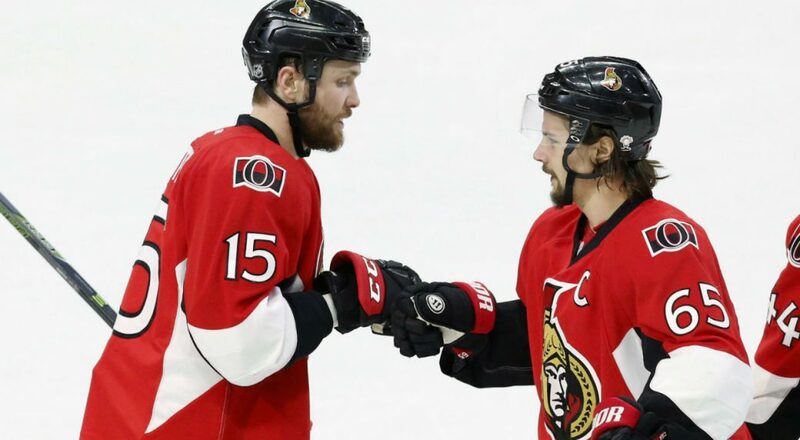 Could the Sens be the surprise team of the playoffs? I guess we’ll find out soon enough. Edmonton Oilers – Much like the Senators, the Oilers have been a bit of a surprise this season as well. In the past few years, Edmonton has surely had the talent to do well, they just haven’t been able to put it all together. But this season, things seem to have taken a turn for the better. They are 2nd in the Pacific Division with 10 games left to play and are 6-3-1 in their last 10 games, including 4 wins in a row. Much of this is due to the talent of Connor McDavid, who has amassed 82 points in 72 games and sits at a crazy high +22. But the whole team in general has been playing very solidly of late, which is great news, heading into a playoff run. Jonathan Bernier, Anaheim Ducks – After a somewhat surprising trade from the Toronto Maple Leafs in the 2016 off-season, Bernier has been proving that he is a very capable number one goalie in Anaheim. With the injury-plagued John Gibson sitting out the better part of of the last two months, Bernier has really been stepping up to the plate. He’s started 26 games this season, won 17 and lost 7, and he’s won the last 4 of 5 games that he’s been the starter. This is really good news for a team who’s number one still doesn’t have a timetable for his return. Tampa Bay Lightning – Who would have thought that team that made it to the Conference Finals last year, would likely not make the playoffs a year later. Tampa has been hurting badly this year. With Stamkos perpetually on the injured list and a host of goalie problems, Tampa does not look like the same team it did one year ago. With 10 games left to play, they sit 4 points out of a Wild Card position in the Atlantic. This isn’t an insurmountable deficit, but it requires a lot of losing from some teams who have been doing very well. Ben Bishop, Los Angeles Kings – Ben Bishop has had a rough go of it this season. As mentioned above, he went from the starting position in a conference leading team last season, to a trade and a downgrade this season. Even in his new position as backup, Bishop has been struggling. He has not had a win since a February 21st game against the Oilers, and has had few starts. It’s a hard time for Bishop, who hopefully can turn it around a little, toward the end of the season. Loui Eriksson, Vancouver Canucks – There’s no doubt about it, Ericsson is having a terrible season. In 65 games he has only 24 points, which is a far cry from the 63 he had in the last. When he got traded last year from Boston, it seemed like he might be an asset to the struggling Canucks, but has not been the case. He doesn’t even crack the top 5 in scoring, but the silver lining in all of this is that he may be a prime candidate for a Las Vegas pickup when the season is over. This week’s shout-out goes to all the backup goalies out there making a difference for their teams this season. While Jonathan Bernier was listed above, there are a few others that could have been included this week as well. The list includes: Antti Raanata from the New York Rangers, Al Montoya From the Montreal Canadiens and Philipp Grubauer from the Washington Capitals. The depth in goaltending in these teams proves why they’re going to be formidable once the playoffs happen. Not only are they housing some of the best goalies in the league, but some of the best backups as well. Extra shout out to all those fantasy hockey players who are entering the playoffs this week. May all your goalies have shutouts and all your top goal scorers get you hat tricks.